The stands were a little fuller, the excitement was a little higher and the cheers were a little louder Tuesday during the sixth race at Indiana Grand. That's because the race included first time starter Distant Shore, who is owned by the Churchill Downs Racing Club. 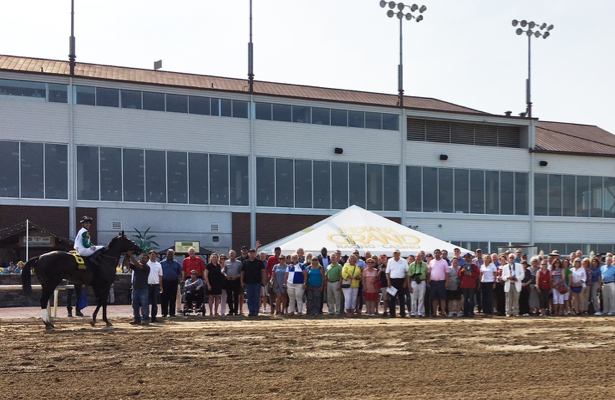 Approximately 75 members of the Club made the trip to Indiana to watch their horse race and break his maiden in the $31,000 two-year-old maiden race going five and one-half furlongs. Willett said her first encounter with Distant Shore was a “meet and greet” at the barn of Tom Amoss. There, she not only met the horse and the trainer, but she also met Palmisano, the Racing Club Manager, who was also in attendance for the debut of Distant Shore. The members of Churchill Downs Racing Club No. 6 will have Distant Shore through the duration of his career. If he makes enough earnings, the Club will purchase another horse when Distant Shore is no longer racing for the ownership club. One owner of Distant Shore is Gina Rodriguez of Kokomo, Ind., who is also a two-time owner in Indiana Grand’s racing club, Grand Gesture Stable. She fails to miss a race of Bold Concept, and she was trackside to witness the win from Distant Shore. Rodriguez will no doubt be trackside to see Bold Concept make her next start for Grand Gesture Stable at Indiana Grand. She was also a member of the inaugural racing Club in Indiana last season that owned A J Pacer. Both horses are trained by Anthony Granitz at Indiana Grand. Rodriguez will also keep close tabs on her latest acquisition, Distant Shore, who was impressive in his racing debut. Ridden by Alex Canchari, Distant Shore got out of the gate as one of the top contenders and sat patiently in a stalking position before overtaking race leader Sambucca and Gabriel Saez in the turn. Distant Shore, who was acquired from the Fasig Tipton Two-Year-Old Sale this past spring for $50,000, strode off from the competition, winning by four lengths as the race favorite. Anothrdayatthelake and Edgar Morales closed well for second over Soap Bubble and DeShawn Parker for third. The time of the sprint was 1:04.84. The win aboard Distant Shore was one of two for Canchari on the afternoon card. Canchari, a native of Minnesota, is among the track’s top five jockeys this season in his first year of riding at Indiana Grand. The win from Distant Shore was also one of two on the program for Amoss, who is currently leading the standings at Indiana Grand. The Louisiana native is a five-time leading trainer at Indiana Grand and holds several training records at the track, including most wins in one season (81) and most money earned in one season, more than $1.5 million.